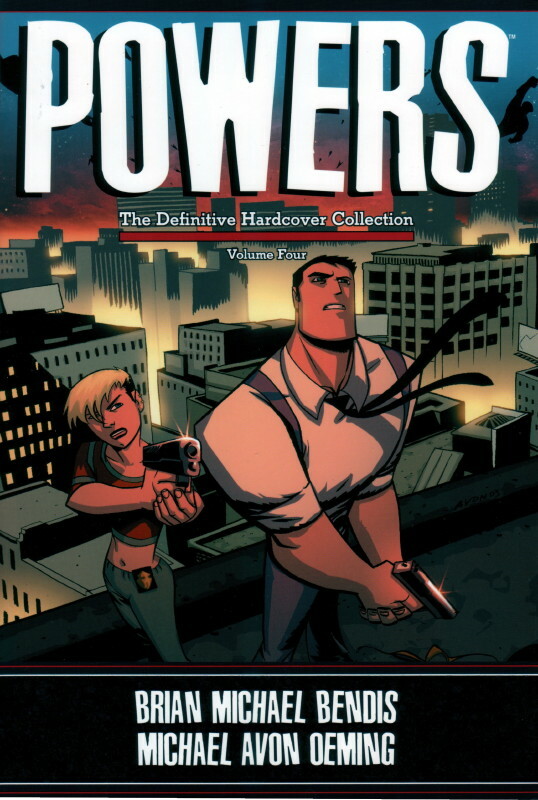 The latest hardcover collection of Powers is out, and it’s a big one, collecting the first eighteen issues of the second series. It’s actually a reasonable jumping-on point for the series, but, you know, why “jump on” with a $35 hardcover collection when you can either buy the first such volume, or just buy the currently-ongoing third series in single-issue form? That aside, the second volume of the series is much more ambitious, and much darker, than the first. Writer Brian Michael Bendis doesn’t spell out such details, but clearly several years have passed since the first issue of the first series. The events of “The Sellouts” have led the United States to outlaw the use of powers, and require people who have them to register them. As you might expect, this means that supervillains go to town (because why should they care of their powers are outlawed), and law enforcement is badly outgunned since all the heroes have retired to comply with the law. The city of Christian Walker and Deena Pilgrim is being divided up by three crime lords. This volume is intense: Deena gets captured by one of the crime lords, leading to a huge and unwelcome change in her life. Walker discovers that a girl he’s taken under his wing since her parents were killed has powers – very surprising powers. Becoming her mentor, she leads other heroes to reconsider their decision to retire. And the case of a man killed by a flying man leads to a big change in Walker’s life. This volume of Powers is about secrets, people who keep them, people who learn about them, and what people do to keep them hidden or when they’re revealed. It remains true to its noir-detective roots, while expanding the cast and setting and raising the stakes. The second series is basically one long story, and it’s really excellent. Thumbing through this made me go back and read the conclusion again. I recommend it highly, as taken as a whole it’s probably the best thing Bendis has ever written. Oh yeah, and Michael Avon Oeming’s art is quite good, too. I admire how he takes the animation-style simplicity he works with and adapts it to a very sophisticated and not-at-all-for-kids story. The incongruity has long since passed, and now it’s just very good artwork in support of a very good story – and that’s a very good thing. 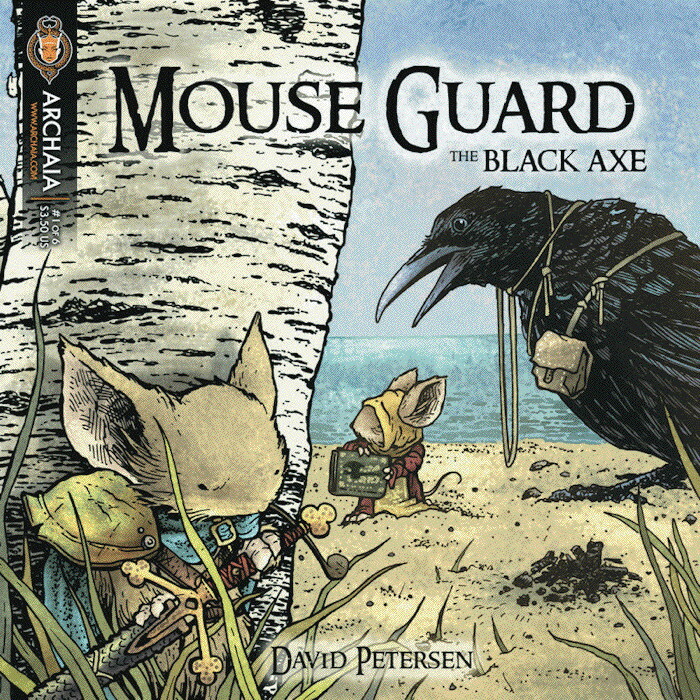 After a 4-issue fill-in series of short stories by other creators, David Petersen’s back with a new Mouse Guard series, The Black Axe. The title character was introduced in the second series as the nigh-legendary champion of mousekind. As this series starts 37 years before the previous series, I think we’re seeing the Black Axe of that series being born, or maybe a broader exploration of his legend. I’m not sure. Sometimes I get a little frustrated with the pace of the series, as there seem to be so many tantalizing details of mouse culture and history, which only get parceled out a tiny bit at a time. But it’s still a fun series, and Petersen’s artwork is lovely, worth the price of admission by itself. This new series picks up after the rather abrupt end of the first one, and includes an 8-page recap of what’s gone before, so you can just jump on here, although I do recommend the earlier series, as it’s excellent. But to put it briefly: The Next Men are five people engineered by a secret government project to give them super powers. Following various adventures in the modern day – during which one of then left the group to join a religious clan – they’ve apparently been pulled back to prehistoric times, where one of them is having lucid dreams involving different twists on their previous exploits, and two of them have disappeared. And from the last page and the cover of next issue, it looks like this series is going to involve a heavy dose of time travel, into the past, which would be rather the flip side of the first issue which involved time travel from the future. 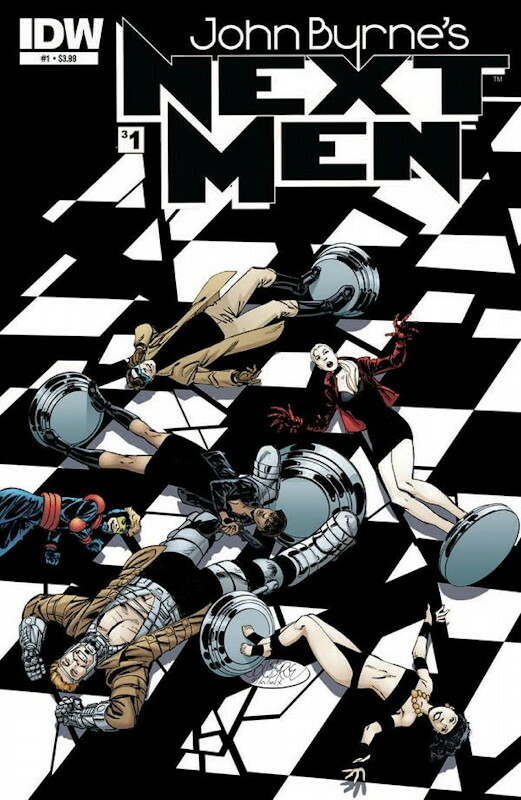 The first Next Men series took quite a while to develop, whereas Byrne seems to be trying to hook the reader with the cool stuff up front, and that’s probably a good idea. But I expect there will be plenty of twists and turns while Byrne pilots the story to its ultimate conclusion. The first Next Men series also fell at a time when Byrne was experimenting with his art style quite a bit, and the art in the series changed and evolved in pretty substantial ways during its run (not all of it working for me; in particular some of his characters’ faces and expressions looks kind of weird in the middle of the run). But Byrne’s style has remained largely the same for the last decade or so, so I expect we’ll see more consistency this time around. While I’m among those who preferred his style in the 70s and early 80s to his newer style, he’s still a very good, very imaginative artist, and working at IDW seems to have reenergized him as a comics creator overall (as I’ve said before, his Star Trek work for them has been a lot of fun). All-in-all, while I personally could have done without the big story recap in the middle, I understand why it’s there, and this first issue is very promising. I’m very much looking forward to more. Next Next post: …And To All A Good Week!